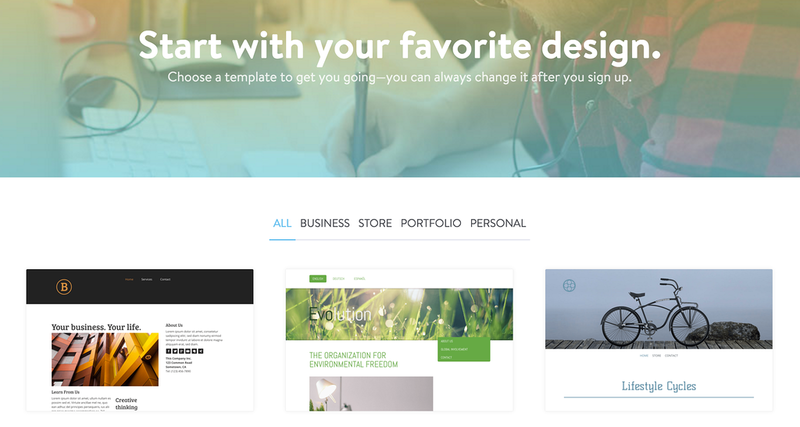 Stylish templates, easy to use interface, and some great functionality. Although it has its limitations, Jimdo is definitely worth checking out. Jimdo was founded in a little farmhouse in Germany, on the principle that it should be fun for anyone to create their own website. Jimdo is an easy to use, e-commerce oriented website builder with excellent and passionate support. If you want to build an online shop without too much hassle, Jimdo is a very strong candidate to fit your needs. If you are building a site without e-commerce, then Jimdo is still a solid opition. The first thing you will notice when you create your account, is that you immediately are able to choose between a number of nice modern looking business, store, portfolio, and personal website templates. In the pro and business accounts, the ecommerce features allow you to transform visitors into paying customers. 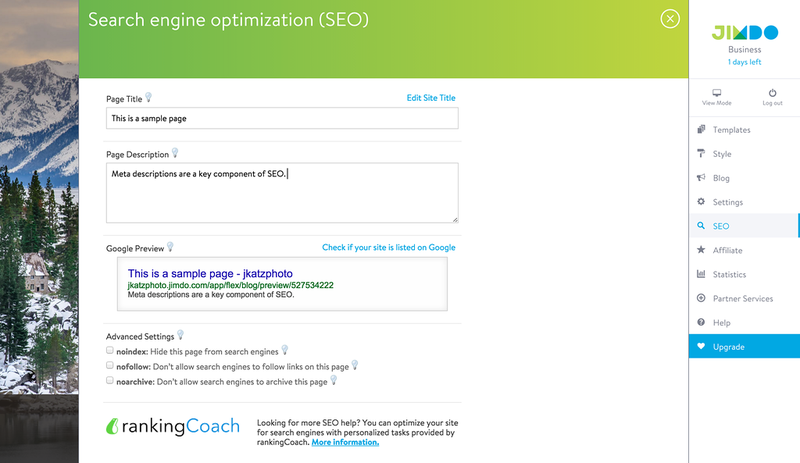 As someone with a detailed knowledge of how on-page search engine optimization works, I can apprecaite the ease of which the SEO part of the dashboard is built right into the editing dashboard. Fields are clearly labeled and explained, and it is put together in a clean correct fashion. A statistics and analytics dashboard is build right into the main side bar. Having in-dashboard site and traffic analytics is a really cool feature that is included with every verison of a Jimdo site. Having a built-in blog post editor within the dashboard, really takes the need to custom design each time you want to add a new article to your site. More on this later on. One of the features that I am most impressed with in the Jimdo interface, is the ability to have a integrated blog publishing system. This doesn't seem like that big of a deal, until you are using a CMS (content management system) that doesn't include this key functionality. Jimdo makes it easy to format, and then regularly update the blog portion of your site with a built-in publishing dashboard. Granted, a blog is not on every-one's hit list as they build a website. Sometimes you are building a website just to publish your portfolio, or your company information, menu, or contact info. But having a regularly updated blog is a great way to keep your visitors and customers updated on what is going on in with your business or personal life. It is also a key component of being able to increase your online presence and drive traffic to your website. That being the case, having blog functionality built into the system, is something that I definitely appreciate. As with any product, there are a few drawbacks to going with Jimdo, some of which you may care about less than I do. There is no right-click protection, and I found that the pages have limited template design and creativity. On the whole, I personally prefer the SmugMug, Wix, or Photoshelter templates. 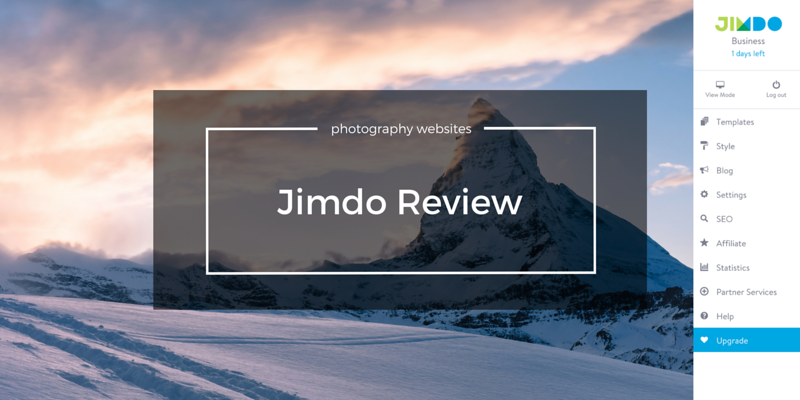 Jimdo is one of a number of the best websites for photographers that I have tried and reviewed. Jimdo is a solid option for creating your website. Whether you are using it to showcase your photography portfolio, or to setup an online store, the full-suite of features that the Jimdo website builder offers will make you happy. I will say that the templates leave a little to be desired, but are clean and simple enough to create a beautiful website. Personally, I prefer to be able to customize the code of my site to a greater extent, but I recognize that this is a personal preference. In short, Jimdo is a great website builder for anyone who simply wants to get a good-looking, functional website up and running quickly.